The images are stunning. A stream of humanity stretched across a bridge, down a dusty road, marching. What do you see when you look at the photos and footage? What do you see? Do you see the families torn apart by the violence in Honduras? To the journalists embedded among them, making the journey alongside them, they tell stories of horror, violence, and threats. They move forward because they have to. They move because that which is human within them compels them. You would be moving, too. You would be marching if you were in their shoes. I’m reminded of the Zimbabwean song which has become such an important tune in American churches, called Siyahamba. We are marching in the light of God, we are marching in the light of God; we are marching in the light of God, we are marching in the light of God. We are marching, we are marching, ooohhh,we are marching in the light of God. “Let me just tell you something. I spoke with Border Patrol this morning. And I spoke to them last evening, and I spoke to them the day before. I speak to them all the time. “And they say -- and you know this as well as anybody -- over the course of the year, over the course of a number of years, they've intercepted many people from the Middle East. They've intercepted ISIS, they've intercepted all sorts of people. “And they said it happens all the time, from the Middle East. There's no proof of anything. There's no proof of anything. But they could very well be. It’s a question of perspective. Politicians see terrorists, ne’er-do-wells, criminals, rapists, security threats, interlopers, and illegal aliens. They see brown skin, poor health, and hungry, thirsty bodies. Disciples of Jesus see people in need; families with little hope, mothers with children, laborers with nothing to do, girls who want a chance. In other words, they see Jesus himself. “Just as you did not do it to one of the least of these, you did not do it to me,” said the king in Jesus’ parable (Matthew 25:45). What do you see? Can you see yourself in that great march? 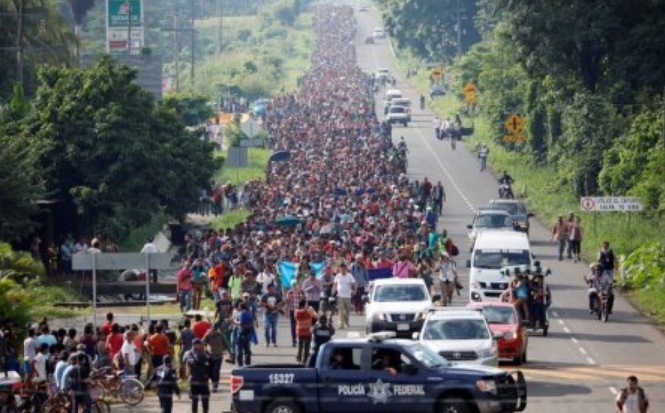 Can you see us in that mass migration? We are a wilderness wandering people on a journey of the soul. May we find our destination in our longing to be whole. may the Spirit be our guide. May we cherish all our children, let us heal our family’s pain. Help us cure our city’s madness, let love and justice reign. we’re the body of Christ together and we know that we belong.